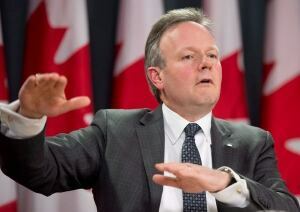 The Bank of Canada kept its benchmark interest rate steady at 0.75 per cent on Wednesday, a sign the bank thinks there's no need for another move just yet after cutting the rate in January for the first time in five years. The bank kept its target for the overnight rate steady, noting that the economy is performing in line with expectations laid out in January's monetary policy report. At that time, the central banked shocked markets by unexpectedly cutting the rate from 1 per cent, where it had been since the fall of 2010. But there was no similar move this time around. "Financial conditions in Canada have eased materially since January, in response to the Bank's recent monetary policy action and to global financial developments," the bank said in a statement. "In light of these developments … we judge that the current degree of monetary policy stimulus is still appropriate." That is central-bank-speak for saying the bank wants to wait and see what the further impact of January's cut will be before moving the rate again, in one direction or the other. Some watchers focused on one particular line in the statement as a clue that another cut could be in the offing soon. The statement hinted that the impact from lower energy prices might be "even more front-loaded than projected in January," Capital Economics noted. The research firm was expecting another rate cut today, but even after the bank did nothing, the company stands by its call that the Bank of Canada will cut the rate to 50 basis points next month. "What happens after that depends on where oil prices settle and whether that weakness in regional housing becomes a national problem," Capital Economics said in a note to clients. Others aren't so sure the bank is in any rush to to anything. Toronto-Dominion Bank economist Brian DePratto said, "Today's decision to maintain the overnight rate at 0.75 per cent is consistent with Governor Poloz's statement that the January cut bought the bank some time to see how the economy responds." The bank's rate is influential, because it has an impact on the interest rates that Canadian consumers get from commercial banks when they borrow or save money. The Bank of Canada meets every six weeks to set its benchmark interest rate. The bank's next scheduled meeting is April 15.